Here you have an overview of some the best surf spots of Costa Rica. Costa Rica has so many world-class surfing spots to explore, no matter which coast you visit there is an abundance of fantastic waves to explore. Here's a map with some of the best surfing beaches in Costa Rica. 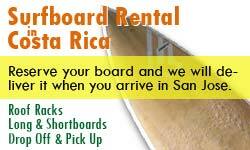 With 1290km of coastline, Costa Rica offers up more beaches, reefs and river mouths than you will have time to surf! There are surf breaks here to suit beginners through to the experienced surfers. Beyond the world renowned Witches Rock, Ollie's Point, Boca Barranca and Pavones, it’s the less surfed spots that often promise the best waves and conditions. Certain areas are just starting to be explored for surf. With just a little bit of preparation and planning, you can enjoy some of the best waves in warm water you will ever surf with a handful of friendly locals!